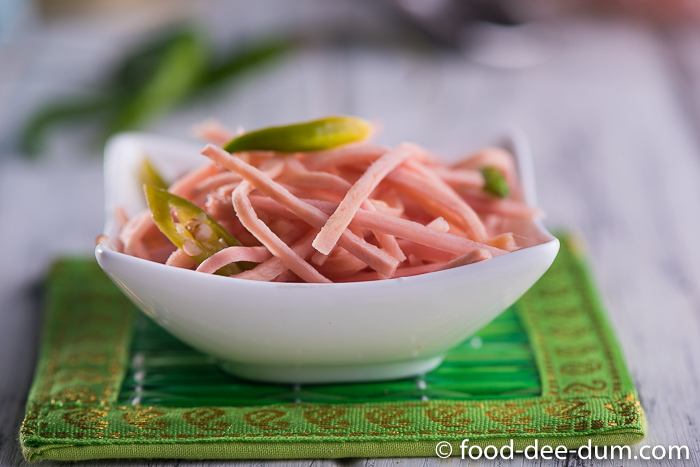 This instant ginger pickle had me at hello. Well, to be honest, at it’s pretty pink colour! An intrinsic part of our summer supplies, my mom has always made multiple batches of this every year. In fact, I don’t even know if we can actually call this a pickle. It literally takes 5-10 minutes to put together and can be made fresh for every meal. 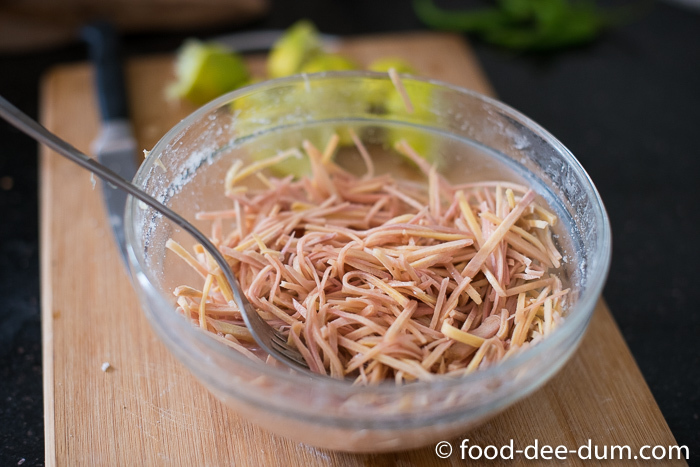 In most North Indian food, ginger-garlic paste is a standard part of the basic masala. And as much as I love garlic, I feel that ginger tends to become the underdog. It doesn’t seem to get as much love as garlic. 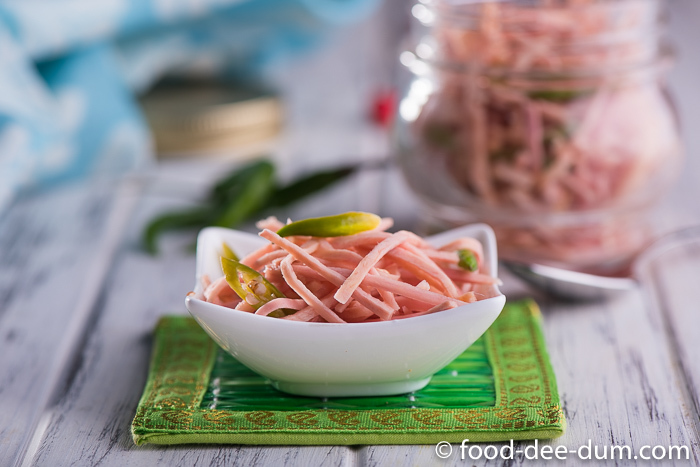 That’s why I love this pickle so much – it brings the pure, unadulterated flavour of fresh ginger to the fore. The pickle is pretty, it’s cooling (for the tummy), it’s delicious and, what’s more, it aids digestion. 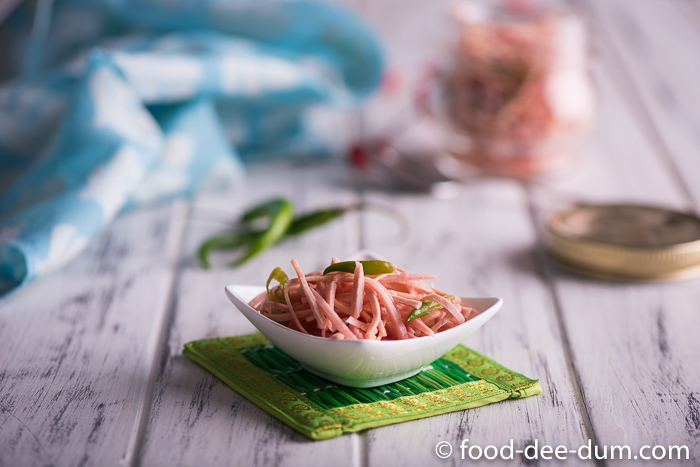 With fresh ginger as the predominant flavour, the pickle gets a little heat from green chillies and some tang from lemon juice. 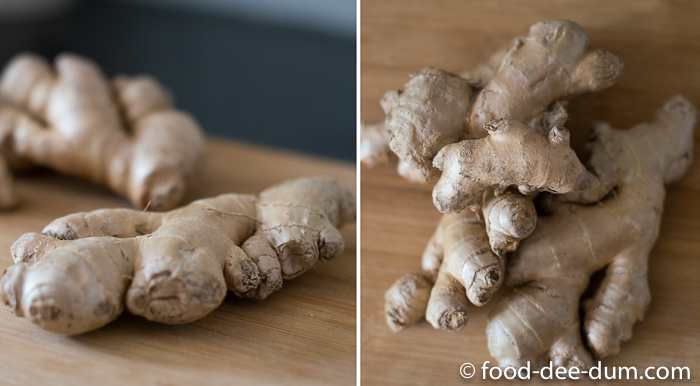 It’s a delicious way of introducing fresh ginger to your diet. This particular batch of mine was actually quite a big one because I had tons of ginger left over from a shoot, but I will share the proportions for a smaller quantity in the recipe summary at the end. I ended up distributing quite a lot of this because it doesn’t have a very long shelf life. It is best consumed in 7-8 days, the sooner the better, and should be kept refrigerated. 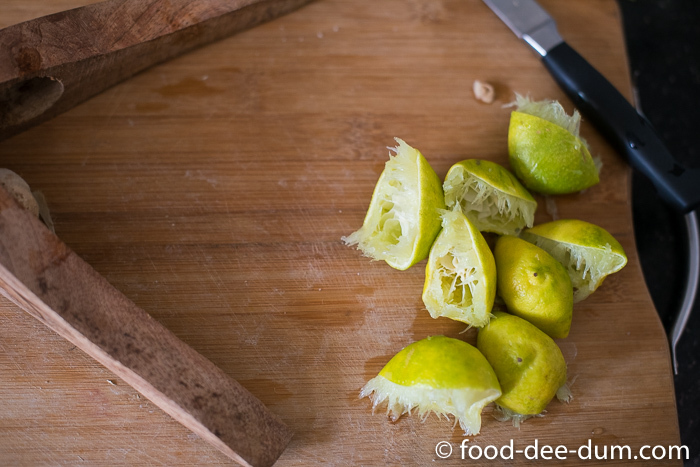 I sliced the ginger thinly and then into juliennes, removing the peel as I worked. The finer the better. This is actually the most tedious part. So that’s another reason to work in small batches! 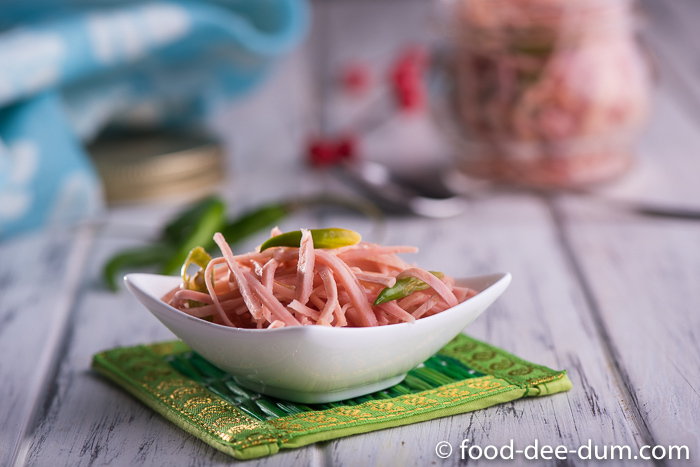 Or you can cut the ginger into small bits, but more than half the charm of this pickle is the prettiness of the julienned ginger! I saved all the odd nubby ends to use in ginger-masala chai rather than cutting them into smaller bits and ruining the way the pickle looked! 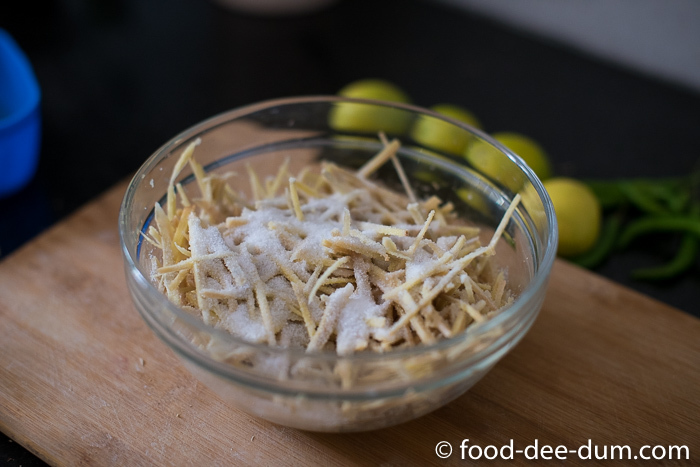 Placing the juliennes into a glass mixing bowl, I sprinkled the salt over it and gave it a good mix. Keeping this aside, I juiced the lemons. By the time I was done with this, the ginger had released a fair amount of water and had softened. Adding the lemon juice, I gave it another good stir and almost immediately it started turning slightly pink. The longer it sits and the more the ginger gets coated with the salt and lemon juice, the pinker it becomes. 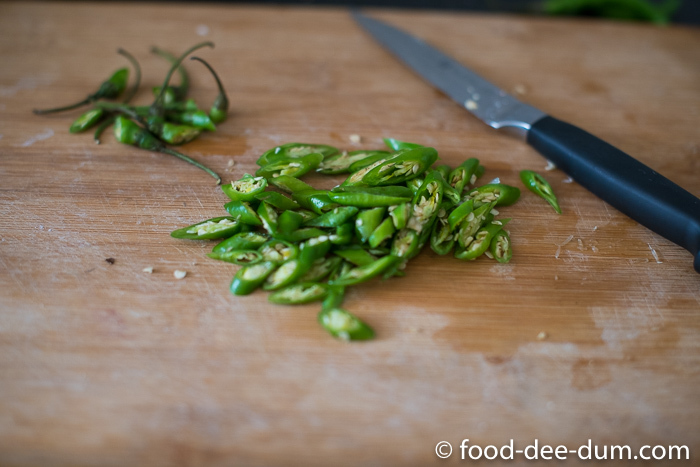 While I chopped the chillies into thin, slightly diagonal slices it became even more so! I added in the chillies and we were done! I transferred this to clean glass jars and refrigerated it for a while. This is not necessary but the longer it sits, the softer and pinker it gets and it does taste better cold than at room temperature. It’s ready to eat right away but I usually give it a little chill time before I serve it. That’s it. We’re done. Didn’t I tell you it’s pretty? So believe me when I tell you it’s delicious too, and go make it right away! Note: I’m not sure about the exact reason for this, but this pickle is best mixed and stored in glass bowls and jars. Plastic and metal don’t have the same effect. 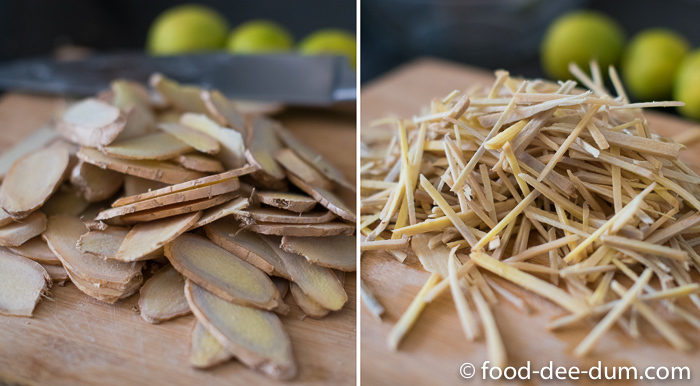 Wash the ginger and cut into thin slices and then juliennes, peeling it as you go along. 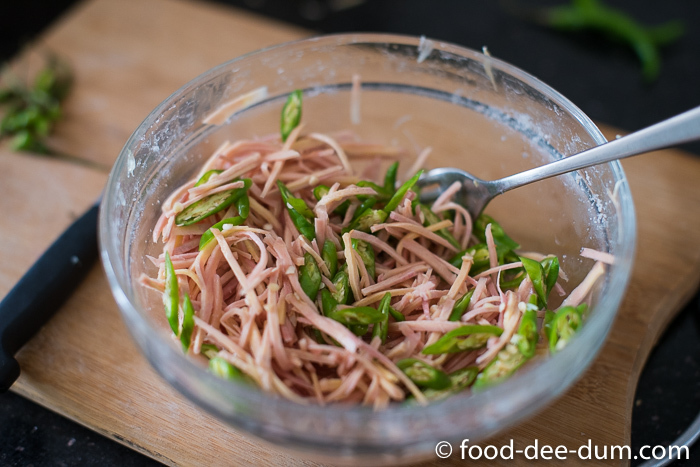 Place the juliennes in a glass bowl and sprinkle with salt, giving it a good stir. This will cause the ginger to release some water and become softer. 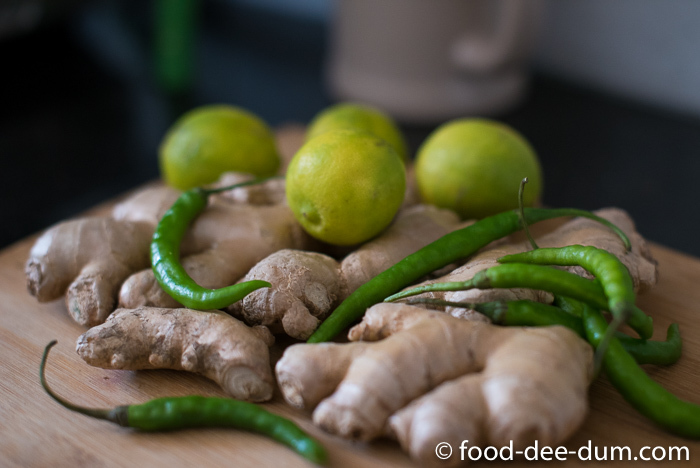 Finely slice the green chillies and add it to the ginger along with the lemon juice. Give it a good stir and let it sit covered for 5-10 minutes. Transfer to a clean glass jar before serving or storing. It is now ready to serve, but will taste even better if allowed to cool in the refrigerator for 30-40 minutes.